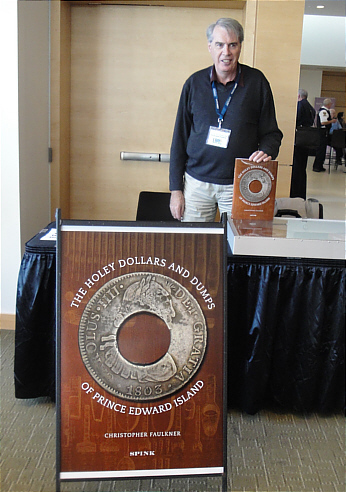 This is the first book-length study to be devoted to Canada’s most exotic and celebrated colonial-era coin, the Holey Dollar of Prince Edward Island and its accompanying Dump. With a basis in twenty years worth of research in international archives, libraries, and private and institutional collections, from as far afield as Charlottetown and Puerto Rico, Vancouver and London, this book uncovers the origins and history of a coin which has been shrouded in mystery for two hundred years. 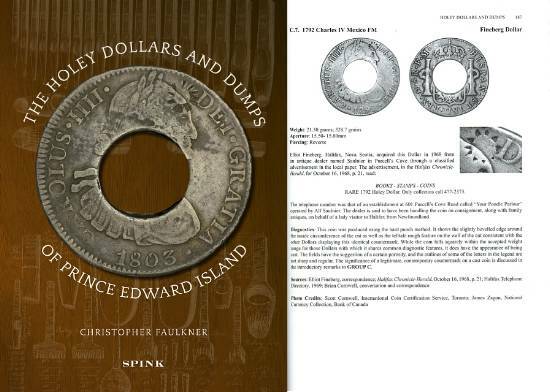 The Holey Dollars and Dumps of Prince Edward Island is published by Spink, London, with the financial support of the J. Douglas Ferguson Historical Research Foundation. The book’s Introduction elaborates the monetary and commercial circumstances, as well as the political and economic conditions, which led to the initial production of this unusual coin in 1813 and to its eventual disappearance over the ensuing years. To that end, the book addresses a number of provocative questions. Who made the Holey Dollars and Dumps? How were they made? How long did they circulate? What could they buy? What were its precedents? Can we distinguish a Government issue Dollar or Dump from contemporary merchant counterfeits? What motivated the counterfeiters? In the course of addressing these questions, the author presents something of the texture of the places and peoples bound up with the Holey Dollar of PEI for the past two hundred years. The people that figure here include collectors and bystanders, merchants and government officials, and the places range from a Canadian homestead to an island in the Caribbean. An Appendix creates an original census of Charlottetown with heads of households for 1813. The Prince Edward Island Holey Dollar has one of the most exciting claims upon our numismatic and historical interest. The Dollar and its Dump represent a unique instance in the whole of British North America of the piercing and countermarking of a coin so that its parts might pass as legal tender. Because they were made from Spanish American Dollars, the most widely circulated coin of its day and a standard of value throughout the entire world, these coins have a legitimate place in many different sorts of collections: the Spanish American series; crown-sized coins of the world; cut and countermarked coins; emergency or proclamation coinage; semi-official colonial issues; and, finally, private merchants’ tokens. There is no other Canadian coin or token that can claim to be so many things to so many interests at once. Christopher Faulkner is Distinguished Research Professor and Professor Emeritus at Carleton University, Ottawa, Canada. In the field of numismatics, his primary area of research interest is the circulating specie of pre-Confederation Canada and he has written a number of articles and book chapters on various aspects of the token coinage of the period. He is a Fellow of the Canadian Numismatic Research Society, among other organizations. We will have official launch of the book at The Toronto Coin Expo with author Christopher Faulkner present for autographing. The show is taking place on September 28-29, 2012 at the Toronto Reference Library in the Apple Salon, at 789 Yonge Street, Toronto, Ontario. Anticipated shipping date will be first week of October after official unveiling of the book. You can ask for an autographed copy to be included with your order. This is the first major numismatic work to appear in Canada for quite some time and we are very proud to be sole distributor of this book for Canada.